CHROMiX Blog - All Things Color Management Colorants (and raves) - CHROMiX Blog: Monitor hoods for everyone! The trouble with being in a business for so long, is that you start to think you've said everything already - so everybody should know it by now. The reality is that new people are coming into the color business all the time and some things we thought were well understood are not talked about much anymore. In this vein I'm surprised at the number of color people I've run into lately who don't use a hood on their display. Maybe no one ever told you, but that overhead ambient light shining down in your room will cast its light on your screen and wash out the colors, especially wash out your blacks. You would be amazed to see how much contrast is lost because your shadows are all washed out by the ambient light shining directly on the screen. Put a hood on there, and your display will instantly have more "pop." Any kind of hood to prevent direct overhead light from falling on the screen would be good. It does not have to be terribly expensive; all it has to do is 1) be light, and 2) block light. Now you have no more excuses! 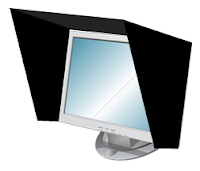 Here's a link to simple, do-it-yourself monitor hood creation instructions that will cost you about $10 at your local craft supply store.